« Fermilab’s Electromagnet Passes by Trossen Robotics HQ Tonight! Interbotix Labs is proud to announce our first entry into our line of Edge Kits! Edge Kits are robotics kits that we are releasing from our R&D labs early. In an effort to make more kits available to the community and to accelerate the innovation cycle we have decided to start releasing “Edge Kits” for advanced builders. The name comes from the term “cutting edge” to denote that these kits are on the front edge of development. The kits are intended as hardware kits and may or may not come with certain levels of code that we and the community is working on, though code will often be available in unsupported beta formats which people are sharing and banging away on to improve. We made the choice to release kits in this format due to the demand we have seen over the years from the community wanting to get their hands on advanced kits faster than the normal cycle. We as roboticists are notoriously impatient people and when we want to build, we want to build now. So the Edge Kit was born. The kits do NOT come with the same level of documentation, code, and/or assembly instructions that our fully support Interbotix Kits do. As a result, these kits are best suited for individuals with previous experience with our kits or other similar applications. 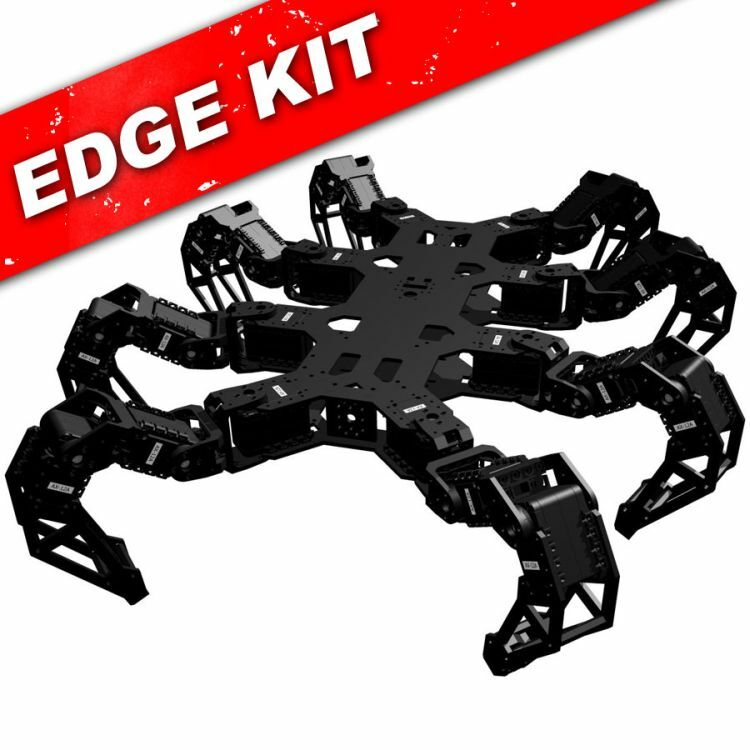 Our first Edge Kit is the Interbotix Octopod. As the name suggests, the kit is an eight legged crawler. Community member KevinO has already gotten his kit up and running with some seriously advanced features and sensing capabilities. His robot Charlotte started life as a PhantomX Hexapod running an Arbotix and from there he modified the legs several times to his liking (a great feature of the modular AX-12 bracket system). Soon a Raspberry Pi and Kinect 3d Camera sensor were added, and he ported over the Phoenix-Phoenix code (another community project for our crawlers lead by KurtE) to run natively on the Raspberry Pi. As he experimented with face tracking, obstacle avoidance and gesture tracking, KevinO expressed a desire to make Charlotte a bit closer to a real spider by adding an additional pair of legs and bringing the total up to 8. And thus, the Octopod project was born. This entry was posted on Thursday, July 25th, 2013 at 8:00 am	and is filed under Featured Projects / Robots, Front Page News, New Kits / Products. You can follow any responses to this entry through the RSS 2.0 feed. You can leave a response, or trackback from your own site.